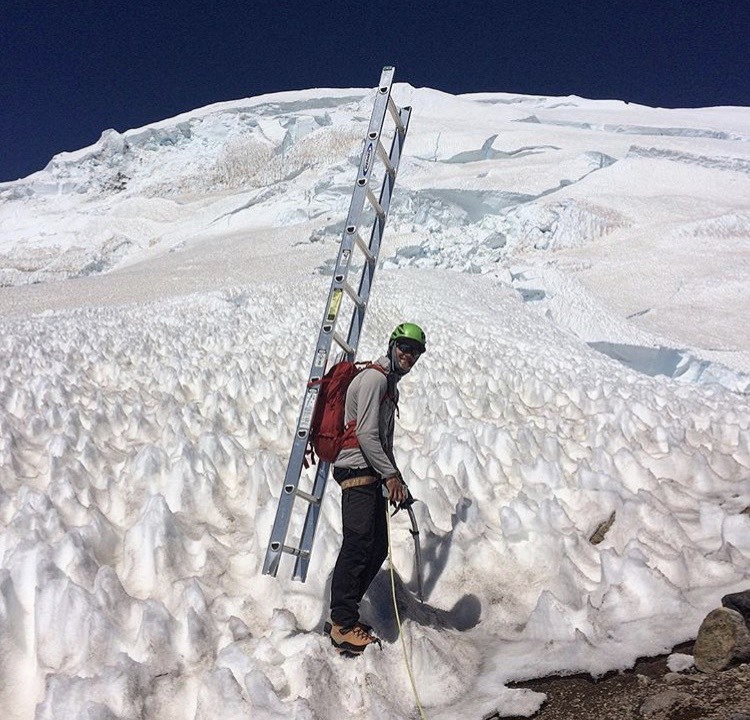 The footwear we choose for a climb of Mt Rainier is one of the most important gear decisions we will make. Our boots will need to be comfortable, warm, and when possible, light. There are two broad categories of boots. Double boots, which we use in colder temperatures and single boots, for when the weather is warmer. Single boots are the lightest option out there. 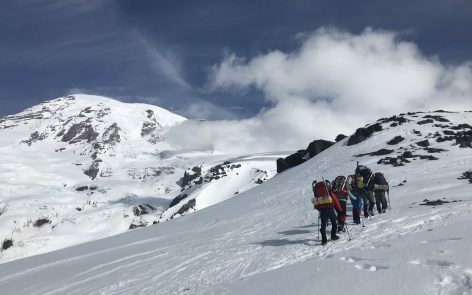 However, they are not very warm and I don’t recommend wearing single boots on Rainier if the freezing levels will be below 10,000′ (ie coldest temps around 25F for just a few hours). If the freezing levels are over 10,000′, then singles boots are a great option as your feet won’t overheat and you’ll carry less weight every step. Single boots are available as both semi rigid and fully rigid boots. Semi rigid boots are lighter and more efficient on trails and rock but are less efficient on snow, particularly if it is steep. For Rainier, fully rigid single boots are the lightest option, but are only for when the weather allows. Since the soles don’t flex at all, this means more efficient travel on snowy slopes as your boot won’t slip out of the tracks and calf fatigue will be reduced, especially with a heavy pack. Fully rigid boots can be identified by the “toe welt” which is a groove in the rubber for crampons to attach to. Fully rigid singles come in several flavors, described below. 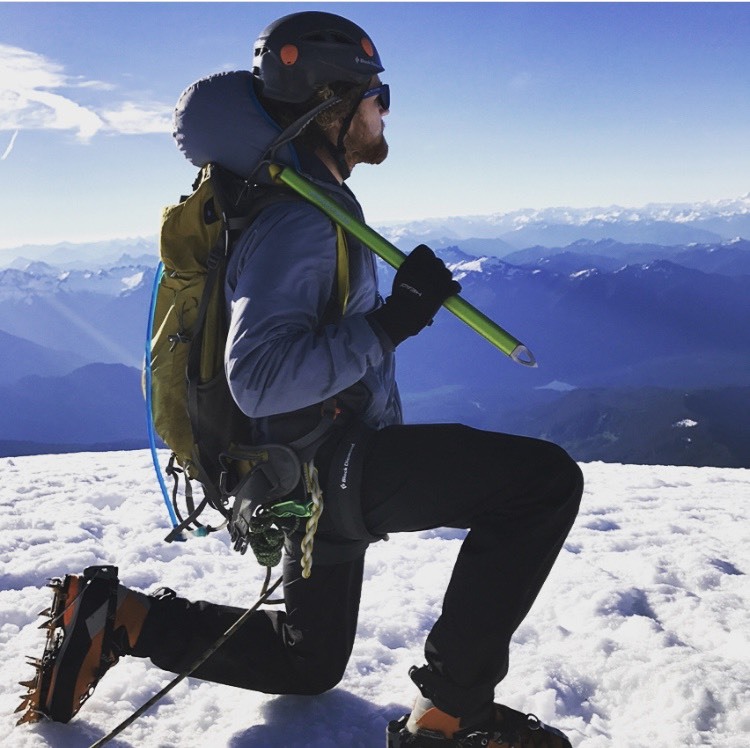 These are the mountaineering boots that most people wear in the summer months on Rainier and similar peaks in the North Cascades. The advantages to these boots include their durability and price. They are typically the least expensive mountaineering boots and will last a long time (perhaps not as long as double plastic boots). If you don’t own any mountaineering boots, this is a good place to start. Downsides of these boots are limited, but they are typically heavier than single super gaiter boots and not as warm as any of the double boots. Popular boots in the category include the La Sportiva Nepal and Scarpa Mont Blanc (or Mont Blanc Pro). All companies offer a leather or synthetic single, find which one fits your foot. Single super gaiter boots are an excellent option for people who want the lightest footwear. These boots are very warm for their weight, and climb technical terrain very well. This light weight and fancy technology doesn’t come without downsides however. These boots are typically more expensive, less durable (especially for those who aren’t used to walking with crampons), and have more parts that can fail such as zippers and boa fasteners (part of the lacing system). That being said these boots are an excellent option for the experienced mountaineer who wants a lighter boot that excels on technical terrain and vertical ice, or someone who desires a small warmth boost over standard singles but doesn’t want the increased bulk of doubles. Popular boots in this category include the La Sportiva G5 and Scarpa Phantom Tech. 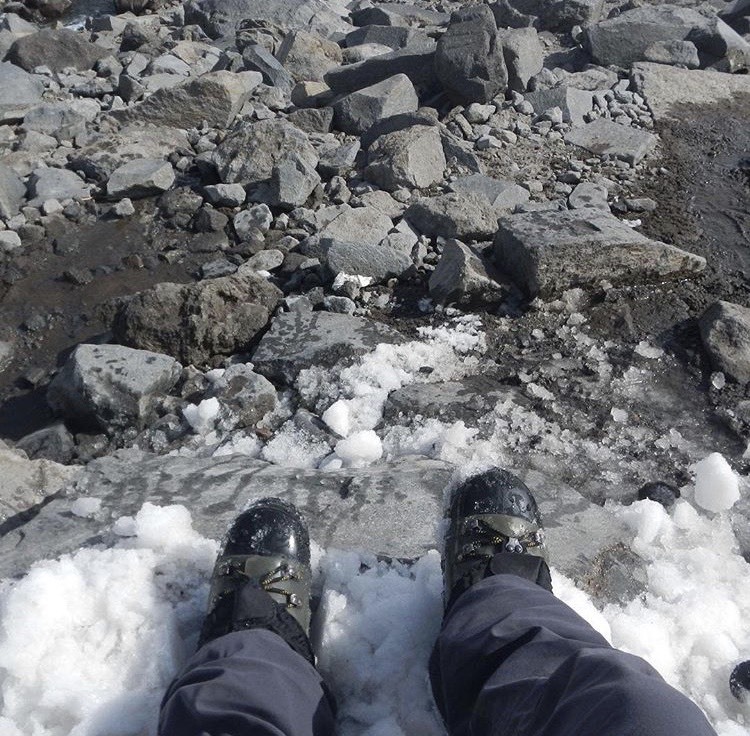 Personally, when guiding on Mt Rainier, I wear double boots about 75% of the time. Whenever freezing levels are below 10,000ft I will wear doubles because I don’t like cold feet. 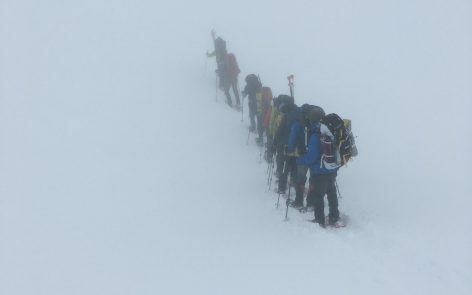 When in doubt, it’s good to err on the side of too warm, particularly when going with a guided group. Double boot refers to the fact that the liners of the boots are removable. This results in a greater amount of insulation and it means the liner can be removed from the shell (just like ski boots) at night to be dried or kept in your sleeping bag to be kept warm. Double boots are heavier but when the weather is cold, there’s no other option. This is one of the workhorse categories of double boots and the type of boot I spend the most time in. These boots are composed of an insulating inner boot inside a synthetic outer boot. They are durable, warm, and heavy. They won’t make you feel like a ballerina but they will get you to the top and back comfortably. Popular boots in this category include the La Sportiva Spantik and La Sportiva Baruntse. Companies seem to be phasing this style of boot out and fewer options are available. Perhaps the true workhorse of mountaineering boots, double plastics are how most people start mountaineering. The first big mountain I climbed was in double plastic boots. Plastics get their name from their shell material. The outer boot is made of plastic like a ski boot with an insulating inner boot. These boots are extremely durable and less expensive than their synthetic counterparts. While they may be one of the heavier options, they are one of the warmest and the boot IMG has rented for Rainier climbs for over a decade. You may find a boot with a better personal fit down the road, but nothing can compete with the range of feet this boots fits well. 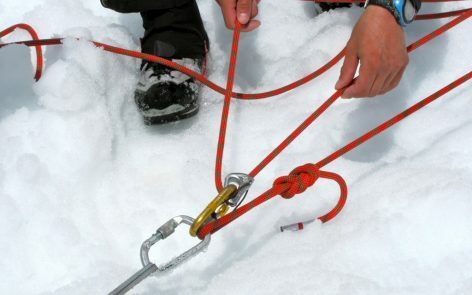 It is important to keep in mind that the cuffs on these tend to be low and this makes it easier for snow to enter the boot from above if the climber doesn’t use a gaiter. For those who wear this boot even in warmer weather, investing in a pair of OR Low Gaiters is well worth it. 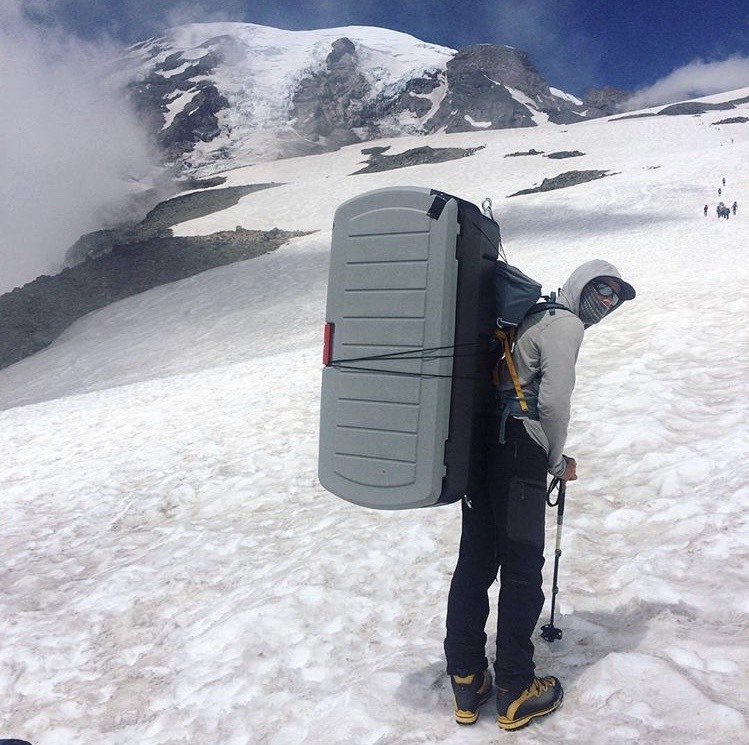 I would recommend going with this option if it’s your first time climbing Rainier, especially in cold weather when a double boot will be required anyway. The most popular double plastic, and the boot IMG stocks in its rental fleet, is the Koflach Degre. These are the Cadillac’s of double boots. Relatively light and very warm, these boots weigh significantly less than the double plastics. Just like single super gaiter boots they are warm and fragile and more suited to the experienced mountaineer with precise footwork. 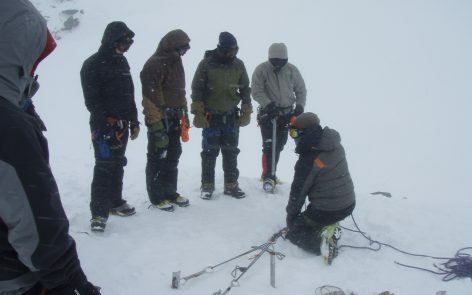 One wrong step could potentially mean a crampon hole in the gaiter of the boot. 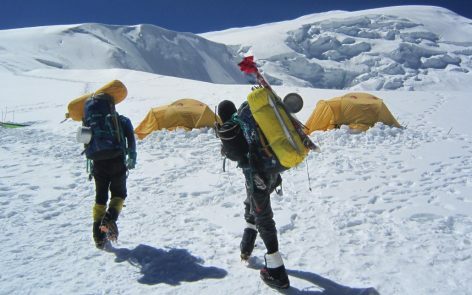 This is the category of boot used on 8000m peaks such as Everest as well as Denali and Mt Rainier. For the highest peaks you will want an “8000m boot” such as the Scarpa Phantom 8000 or La Sportiva Olympus Mons. For Rainier an 8000m boot would be a poor choice, they are too warm and too heavy. For Rainier we want a boot with a 4-6000m designation. Some popular options in the range include the La Sportiva G2SM and Scarpa Phantom 6000. A new offering that is lighter and less warm than the previous 2 boots but still warmer than any single boots is the Arcteryx Acrux and may prove to be a good option for Rainier. All boots in this category will be expensive. Alright, I know what type of boot I want, but there are so many options! How do I choose? This isn’t easy, boots are expensive (sometimes in excess of $1000), so making the right choice the first time is ideal. Getting a well-fitting boot will do more for your comfort and success on your climb than any other single piece of gear. And this is no easy task, you can’t just buy a pair that doesn’t fit well and “break them in.” This may work to an extent with hiking boots but the rigidity in mountaineering boots generally prevents them from forming to your foot to any noticeable degree. The boot should feel good as soon as you put it on. Your best bet is to go to a retailer and try on all the boots they have, even if they don’t fit into the category of boot you’re shopping for (you’re unlikely to find a retailer that stocks many double boots). If the retailer you’re shopping at doesn’t have a boot in the category you want that also feels good, then write down which companies fit you and in what size. If they do have a boot that fits all your requirements, then congratulations, you’re the lucky minority! For the rest of us, once we have our notes about what companies fit us in what size, we can start shopping online. I’ve bought all my boots used though forums or craigslist. You can save a lot of money this way but you have to be willing to shop around to find the boot you’re after. Otherwise, shop through online retailers to find the best price, plus many of these allow returns in case a company has different fits in different type boots. I mentioned mostly La Sportiva and Scarpa boots, there are many other boot manufacturers, these are just the largest two. Asolo, Boreal, Lowa, Mammut, Salewa, and Garmont, all make great boots that may fit your foot best and often these companies have lower prices. 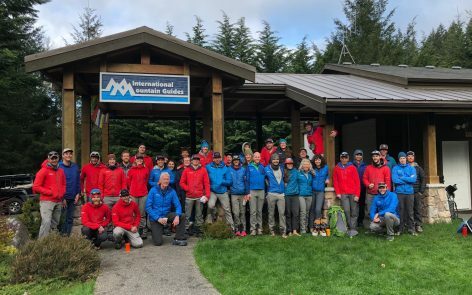 Feel free to email office@mountainguides.com or call 360-569-2609 with your questions and be sure to follow @porter.mcmichael and @intermationamountainguides on Instagram for inspiring pictures of the world’s great mountains and treks!